A suspect surrendered to police in Revere after a standoff. A police standoff at a hotel in Revere, Massachusetts on Thursday afternoon has ended peacefully. 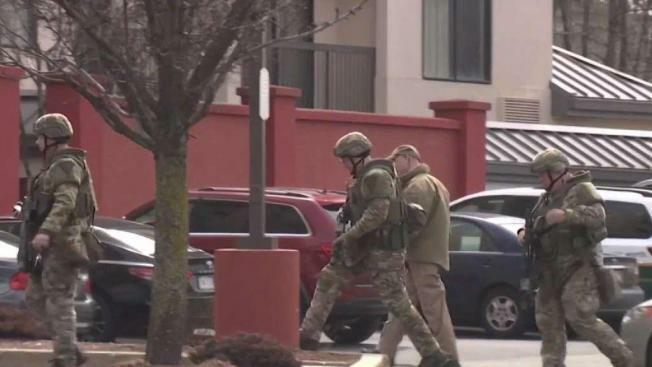 Massachusetts State Police said they were called to the Quality Inn on Route 1 around 12:30 p.m. for a standoff with a "potentially armed and dangerous suspect." A hotel guest had reportedly locked himself inside his room and was refusing to come out. The suspect, identified as 44-year-old Anthony Bova, surrendered to police around 1:30 p.m. Police said he was wanted in connection with a serious domestic assault on a woman earlier in the day in Chelsea and will be turned over to Chelsea Police for booking. Guests were evacuated from the hotel while police attempted to apprehend the suspect. Malden police had said on Twitter that there was an "ongoing incident" on the east side of the Revere line and helicopters were hovering over the scene. They said there were no issues with school release and the incident was considered contained to the address outside the city. "He's facing serious assault charges, possibly up to and including assault with attempted murder," Massachusetts State Police spokesperson David Procopio said of Bova. The victim of the assault told NBC10 Boston she did not want to go on camera and that she feared for her life.